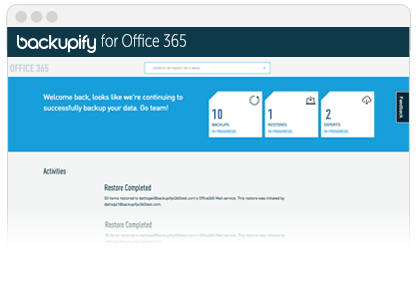 Backupify is the leading cloud-to-cloud backup and recovery solution for software-as-a-service (SAAS) applications, including Office 365, Google Apps and Salesforce. A backup of these applications gives you the piece of mind knowing you can recover from a vendor disaster. More and more companies rely on Office 365 to get business done. With all that cloud data, we are presented with new set of data risk concerns. What if someone accidentally deletes or overwrites a file? How do you make sure business critical cloud information isn’t tied to the person who created it? When employees leave the company, can you prevent their files and information from leaving with them? Backupify goes above and beyond industry standards to make sure your enterprise Office 365 data is secure and protected. Backupify saves you time and stress with robust search filters that make it easy to quickly locate backed up files and folders. Even if the user can’t remember what they called it.